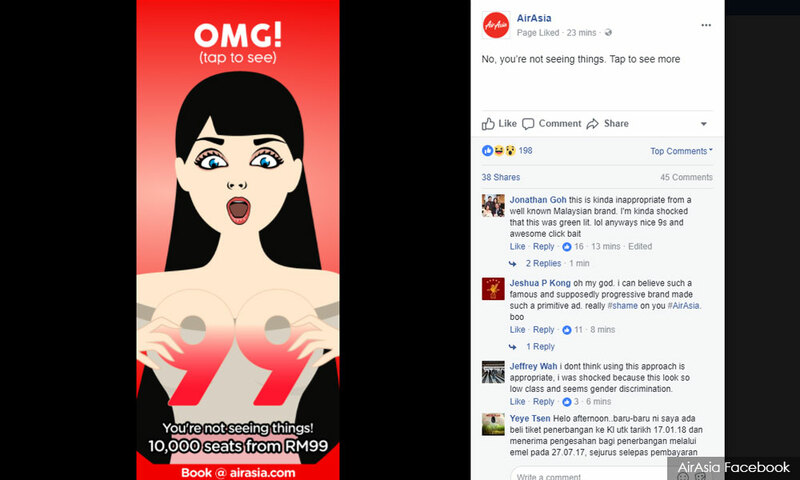 AirAsia has removed an advertisement posted on Facebook after courting flak from netizens, who accused it of being sexist. The removal was communicated to Malaysiakini via a text message from the budget carrier's corporate communications team. 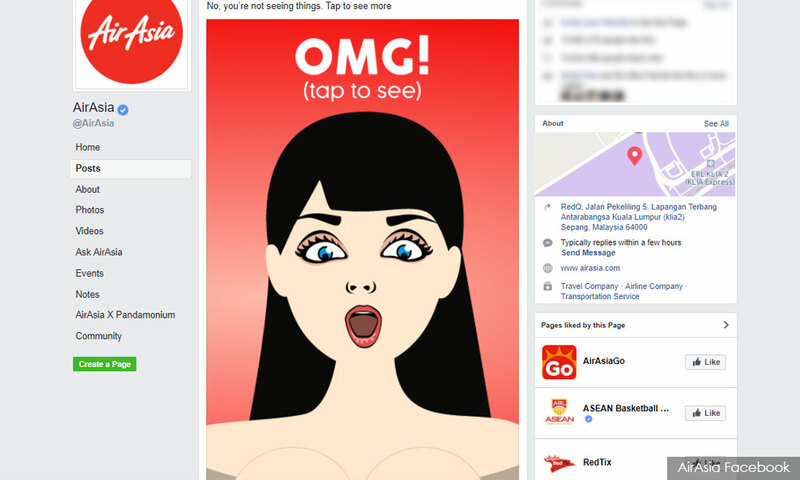 “AirAsia is aware of the feedback received towards an advertisement posted on its Facebook page which has since been removed upon thorough review. “AirAsia would like to apologise for the inconvenience caused by the advertisement,” read the message. The advertisement had featured the drawing of a woman whose bosom appeared to be showing through the top of her dress. The caption read “OMG! (tap to see)”. Upon tapping, the full sized image revealed her holding the figure “99” to indicate the airline's cheap fare. “You are not seeing things! 10,000 seats from RM99,” read the caption. The advertisement had received negative reactions from Facebook users who left their comments on the advertisement posting. "This is kind of inappropriate from a well-known Malaysian brand. I'm kind of shocked that this was greenlit," said Jonathan Goh, who described the advertisement as a "clickbait." "Oh my god, I can't believe such a famous and supposedly progressive brand made such a primitive ad, really shame on you AirAsia," said Jeshua P Kong. Another Facebook user Jeffrey Wah said: "I don't think using this approach is appropriate, I was shocked because this looked so low class and seems (like) gender discrimination," he said. The advertisement was removed about two hours from the time it was uploaded.